It is Day one of our February Challenge – The Clean Eating / Food Diary Challenge! Our 3 main GOALS: eating clean, keeping a food diary for 3 weeks (Feb 4 – 24) and exercising 5 days a week (45 minutes minimum). If we are consistent, we will develop habits that will become permanent lifestyle changes. That is the Key. If you are like me, you are not interested in losing weight just to see it come back in a month or two. Releasing the weight for good is our ultimate goal. Recipe Resources: I want to share with you a list of free resources for eating clean. I’ve been gathering this information so that I have plenty of recipes to choose from during the challenge. One of the main goals of eating this way is to avoid highly processed food/junk food and replace it with healthy food. You want to use recipes and meal planning so that you are prepared make the switch. Take some time to do your research and find new things to eat so that you have tasty options. 5 Great Skinny Salads You Should Try – I put together this list of 5 great salad recipes. Clean Eating Magazine – This is my favorite source of clean eating recipes. I make a lot of their “5 ingredient meals” and “20 ingredients or less” recipes. Gracious Pantry – This website has a ton of great recipes categorized in a number of different ways. I love their breakfast recipes. He and She Eat Clean – This site offers not only great clean eating recipes, but also gluten-free recipes and shopping lists. EatCleanDiet.com is the go to site for clean eating recipes. It is the official site of the book of the same name by Tosca Reno, who brought the kind of clean eating that bodybuilders use info the public eye. Don’t forget to join us tonight from 8-9 pm Eastern for our weekly weight loss support chat. 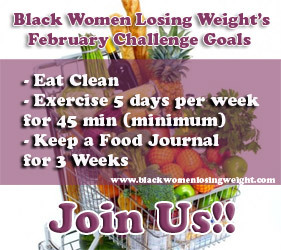 We will discuss clean eating and our February goals. Login at 8pm.